As I watched the coverage of massive crowds across the world for today's Women's March, I began to wonder if perhaps 100 years ago following the 1917 inauguration there might have been similar gatherings. The photo below shows March 1917. In 1917 the inauguration was on March 5, 1917. Most inaugurations took place in the month of March until 1937. 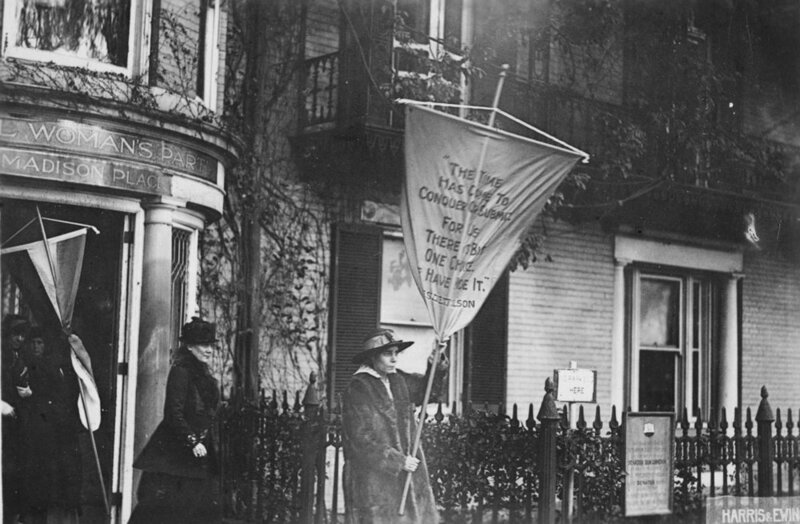 The photos I found on the Library of Congress website (courtesy Harris & Ewing) show women picketing in front of the White House. Some of the photos do not display a month, but all are from the year 1917. 100 years later women are still fighting for their rights, and in the same way that women in 1917 met opposition from a large portion of the public, today's Women's March also met opposition. Today in some cities women blocked traffic, and in 1917 they did the same thing in front of the White House. Also, arrests were made in 1917 for peaceful protests, as described by some of the photos. According to this photo, six months in prison was a sentence given to some women. The women in 1917 and 2017 all had clear goals. In 1917 they wrote them on signs. At today's marches they still had signs, but they also created websites and organized on social media pages. Women have been fighting for rights for well over 100 years, but it is striking to compare post-inauguration 100 years ago to what happened today. Crowds today show those in favor of women's rights are stronger than ever. It should be a compelling moment for those who are opposed to today's marches to see these images from 1917, and realize that perhaps it is those who gather by the millions to march peacefully who are on the right side of history. If after this week you seek a inspiration that there can be good and honest politicians in this country, I direct you to my recent documentary that tells the most fascinating tale in New York history.